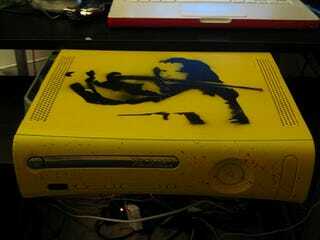 Well, we've seen a Kill Bill Guitar Hero guitar before, so a 360 casemod is not all that surprising. But this one is very well done and, furthermore, was accomplished by Kotakuite Chu Boi, who shows his work on his blog. It's got some great touches, such as the blood spatter across the faceplate, and the stenciled movie quote on the underside. Probably a good thing he violated his warranty by disassembling the machine (which already RRoD'd, and somehow received a second heat sink in the process) as I doubt he'd want to send this work of art off to be scrubbed clean or replaced. Of course that means no chance for the rest of us to randomly get this as a refurb unit. And how cool would that be.